Happy best candy in the history of candy season!!!! Amen sister! I owe some serious belly fat to those little darlings. Step-by-step (WITH photos!) recipe on how to make your own homemade Cadbury eggs. Cadbury eggs are the best invention ever. YESSSS!!! I love them frozen. And I eat them until they make me throw up. It's gross. Amen!! Love a Cadbury Egg!! LOVE Cadbury Eggs. I may or may not have eaten three in a day a few weeks ago. I blame it on pregnancy cravings! I have to say though I get bummed when the cream filling is thick and starting to crystalize and not ooey gooey. Oh and I especially love that a lot of people DON'T like them so you can usually find tons of them on clearance after Easter. I don't eat Cadbury Eggs. I can't. If I do, I cannot stop. Seriously. Cannot. Stop. I love these so much. I left about 6 boxes of them at my mom's house (so I wouldn't eat them) and they seriously lasted until November. My second favorite candy is the Easter peanut butter M&Ms (the egg shaped ones.) I swear they taste way better than the regular round ones. Ha ha, I blogged about the triumphant return of the egg as well... and haven't stopped eating them since. It's a darned tootin' good thing they aren't sold year round!! I'm all about the Dove Truffle Eggs...and guess what? I haven't found them ANYWHERE this year!!! Lol bought my first egg of the season yesterday.....yum! Oh yes. I heart Cadbury Eggs & Jellybeans more than anyone really should. Bring it, candy aisle - bring it. i bought my first one feb. 15 and it made me so very happy. i love that weird egg colored goo inside. happiness! oh, i do love me some cadburys! I have never been able to understand the attraction to them. Even as a kid I thought they were gross and way too sweet. But everyone else seems to love them. Glad you are getting your fix! I love the candy covered malted robin's eggs. I am in total agreement. However, I am grateful they only come out once a year. I can't imagine how many pounds could accumulate with them all year round! My Mom and I have a Cadbury Egg competition each year. Who sees the first one in the store and buys it for the other. I won this year! These are my favs!!!!! Thank goodness the Easter season is upon us. Tee hee. I swear you are my California twin! I am a FAN of the Easter Candy. 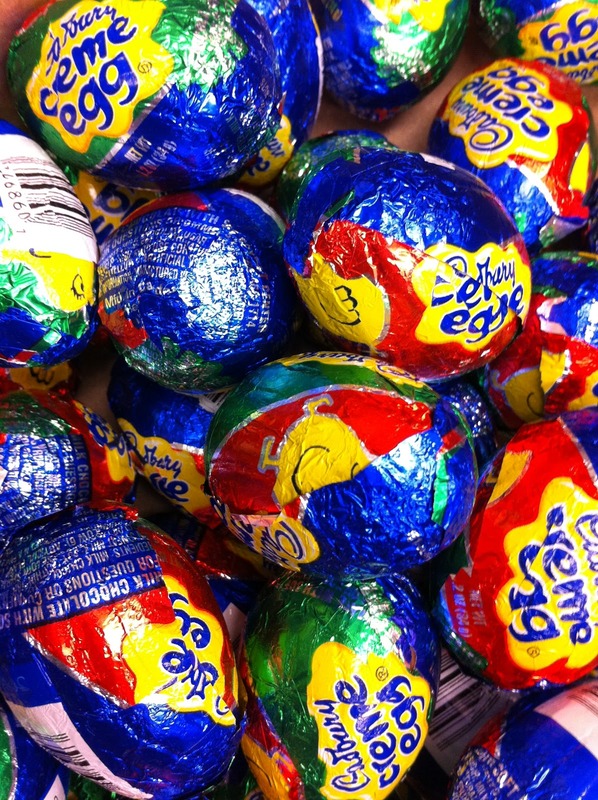 I get giddy when the Cadbury eggs and Peeps return! Delish!